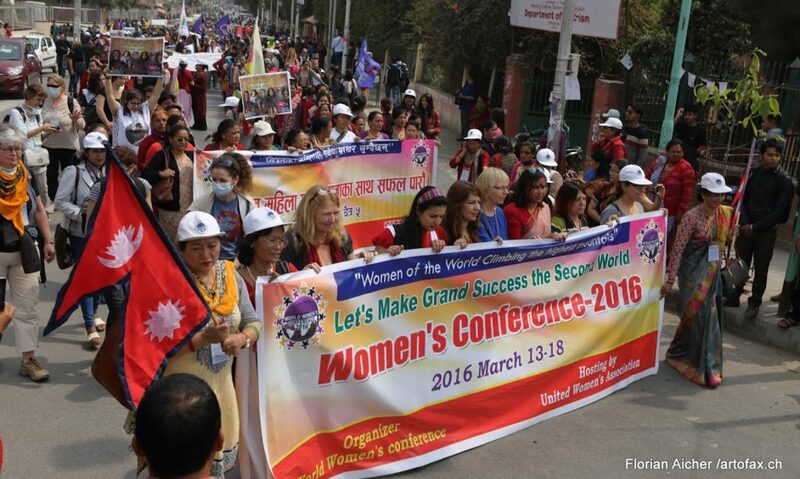 may be you have heard that we have had a march yesterday to bring back a German delegate named Shamla to Nepal. Here you can see a film on our march. For background information please also read article below. We want Shamla in Nepal! The young delegate Shamla Sarabi from Essen/Germany, born in Afghistan, was not allowed to come to WWC but was kept at the Kathmandu Airport by Nepali Authorities und forced to fly back with the next available airplane to Dubai. The reason given for this by Nepali Authority was that her passport, despite a fully valid, would not be readable by maschine. Xaya Nehmet (Kurdish name Rengin Renas); Representative of the Womens’ Protection Units (YPJ). On my behalf, and that of the Women’s Protection Units, YPJ, I would like to commend this conference; which we consider a major step confirming the will, strength, and role of women in the achievement of social change and renaissance. I would also like to extend to you the greetings of each and every one of my comrades in the trenches, battling to defend every inch of Rojava, Syria; fighting on behalf, and in the name of, all women in the world. 1 – Throughout history, women like Cleopatra, Zenobia, Rosa Luxemburg, Clara Zetkin, Leyla Kasim, Zerifa, Zada Sultan, and Kara Fatma have played key roles in leading women’s revolutions around the world, and that leading spirit is continuing in the Kurdistan Liberation Movement, where Kurdish women such as Zilan, Viyan, Shilan, and Sara, have been pioneering the peaceful cause of women’s freedom, while serving as a true example for thousands of Kurdish women to come. There is no freedom for every single woman until every woman in the world has got power over herself. Women’s solidarity is the basic for women’s freedom. By The Left Democratic Women of Afghanistan, from Europe. We the Left Democratic Women of Afghanistan from Europe, who have already been fighting for 50 years to get rid of the oppression of Afghan women from double exploitation, namely patriarchal and fundamentalist order, want to send our warm greetings to you. Currently, women in Afghanistan are facing a war, which capitalist countries, especially the USA are waging against our country. They have created two dark forces: the fundamentalist Taliban and ISIS, which have been imposed on the people. The bloody events of recent years, i.e. forced marriages of underaged girls, stoning, burning, beheading, ears and nose cutting, removement of women’s reproductive organs by husbands, are evidence that the women of Afghanistan are in a state dominated by patriarchal fundamentalists in a very insecure environment. Despite the presence of international forces, and human rights organizations, the plight of women of Afghanistan is getting even worse. For example, the UNAMA newsletter in March 8th of this year reported that violence against women in 2015 has grown by 37 percent.